Board games are a fun pastime that many people enjoy, but it can be frustrating when you're in the mood to play and simply don't have enough people. Many popular games, such as Catan or Cards Against Humanity, require several participants, and some days you just don't have enough players. To get your board game fix without a big group, you'll need a two player board game. These games can be played with just you and one other person, making them an unbeatable option for date night, family game night, or a random weekday. Some of these games even work better with two people. Whether you're looking for a strategy game that will challenge your mind or a fun and light-hearted card game, here are the best two player board games that you can buy. 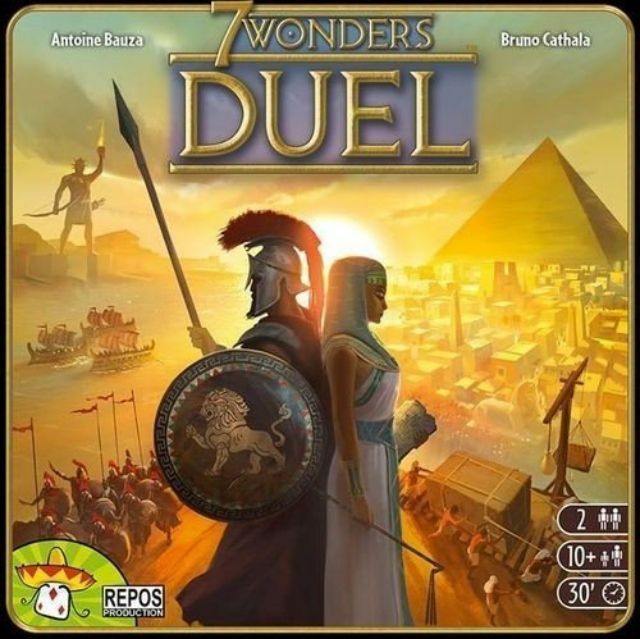 One of the most highly-rated, engaging two-player board games today is 7 Wonders: Duel. This game is an adaptation of the award-winning original board game, 7 Wonders, but it's designed specifically for two people. 7 Wonders: Duel is recommended for ages 10 and up, and each round takes about 30 minutes. During the game, two players go head-to-head, competing to build a civilization to crush your competition, striving to build architectural “wonders” along the way. You can win by achieving military, scientific, or civilian supremacy, giving you numerous paths to victory. This board game has an impressive 4.8 star rating on Amazon, and reviewers call it one of the best two-player games they've ever owned. Many love the variability and mechanics of 7 Wonders: Dual, writing that the numerous ways to win make it an engaging game with lots of replay value. Another top-rated two-player game is Codenames Duet, which promises to provide hours of fun with its cooperative gameplay. Similar to our top pick, this game is an adaptation of the highly rated Codenames board game, adjusted so it can be enjoyed by just two players. ﻿Codenames: Duet is recommended for two players age 11 and up, and each round will take about 15 minutes. During gameplay, you take turns giving one-word clues to your partner, striving to identify your team of “secret agents” from a grid of 25 cards. If you reveal the assassin or too many innocent bystanders along the way, you lose! According to reviewers, this game does a great job blending the basics of the original Codenames with cooperative play, making it a great two-player game that you'll want to play over and over. Plus, the rules are easy to learn and gameplay is quick! Want a game that will challenge your brain? Then you can't go wrong with Sequence, a versatile strategy game you can play with two people or a large group. Sequence is recommended for players 7 and older, and you can play with anywhere from 2 to 12 people, broken up into teams. The concept of the game is relatively straightforward: you put down playing cards from your hand and place a chip on the corresponding space on the game board. The object is to get five chips in a row, but your opponent may very well see your strategy and work to block your progress. Even though the game is relatively simple, people say it's both entertaining and challenging for players of all ages. Cooperative games are the latest trend in board games, allowing you to work together instead of competing against one another. If you're looking for a cooperative game to play with two people, you should definitely consider Pandemic—but only if you're up for a challenge. ﻿Pandemic is recommended for players ages 8 and up and each game will take between 45 minutes to an hour. The object of this cooperative game is to save the world from an outbreak of disease by working together to contain and cure the various strains. This game is especially challenging, as epidemics and outbreaks can spread diseases across the board faster than you can contain them, and there are several ways you might lose. Reviewers write that this game is particularly addicting, as you'll want to keep playing until you can best it. Pandemic has ample replay value, as no two games will ever be alike, making it in essential for your collection of board games. Whether you're 8 or 80, you'll love playing the strategy-based board game Santorini. While you can play this game with up to four people, it's still just as fun and engaging when you have two players. Santorini is recommended for players age 8 and up, and you can play with two to four people. The object of the game is to build structures on the island, racing to be the first person with a three-story building. Each player also holds a game-changing God card, however, which you'll need to anticipate if you want come out on top. Many people play this game with their families, as the rules are easy enough for children to grasp. However, there is still a lot of critical thinking and strategy involved in Santorini, making it a top-rated game, even among experienced gamers. Want to take a look at some other options? Check out our round-up of the best family board games. If you're looking for a board game to play with adults, you can't go wrong with Ticket to Ride. This extremely popular game can accommodate up to five players, but it's equally entertaining when there are just two of you. People describe this as a “light” strategy game, because you do need a game plan to win, but it's not too thought-intensive. Overall, many people say this is one of their favorite board games, and it gets especially competitive when you're playing with all adults. Need some more help finding what you're looking for? Take a look at our selection of the best board games for adults. Keep young children entertained for hours with the two-player Ladybug Game. This is a perfect first board game for little ones, as it's easy to grasp and supports both reading and counting skills. ﻿The ladybug game is best for children ages 3 and up, and it takes about 20 minutes to play. During the game, players lead their ladybug home across the board, trying to avoid praying mantises and aphids, which will hinder their progress. The game teaches children about numbers, words, and colors, all while being a whole lot of fun. Reviewers say this is a great game for children in preschool and lower grades of elementary school, and many note the games are fast-paced and easy to understand for all ages. Overall, it may not be a whole lot of fun for adults, but The Ladybug Game will certainly keep children engaged. While categorized as a board game, Forbidden Island is actually more of a card game—but that doesn't make it any less fun for two players. ﻿This cooperative game is recommended for players 10 and up, and each round takes about 30 minutes. The award-winning game takes you on an adventure to capture four sacred treasures from ruins on the island, and it requires strategic thinking and cooperation to win. What's cool about Forbidden Island is there are multiple levels of difficulty, so it can be as challenging as you choose. One of the highlights of this game is that it's easy enough for children to play, yet still challenging for adults. Reviewers call it clever and lots of fun, and as an added bonus, it’s super affordable at less than $10. Our writers spent 2 hours researching the most popular two-player board games on the market. Before making their final recommendations, they considered 15 different games overall, screened options from 15 different brands and manufacturers, read over 30 user reviews (both positive and negative) and tested 3 of the board games themselves. All of this research adds up to recommendations you can trust.